The Barre des Écrins is a mountain in the French Alps. It is the highest peak of the Massif des Écrins and of the Dauphiné Alps mountain range. It is in the Écrins National Park (French: Parc national des Écrins), one of the ten French national parks. It is the only mountain 4,000 m (13,123 ft) or higher in France that is outside the Mont Blanc Massif. 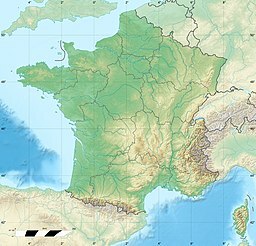 Before the annexation of Savoy, that was part of the Kingdom of Sardinia, in 1860, it was the highest mountain in France. Barre des Écrins is in the northeast of the Hautes-Alpes department (commune of Pelvoux), Provence-Alpes-Côte d'Azur region, in southeast France. The south side of the mountain is rocky while the soil of the north side is covered with ice because here starts a glacier, the Glacier Blanc. Glacier Blanc, on the north side. It is 5 km (3.1 mi) long. Glacier Noir; its northern part is on the southwestern side of the mountain. It is 3 km (1.9 mi) long. Glacier de la Pilatte, or Glacier du Vallon de la Pillate, on the western side. It is short, 1.5 km (0.9 mi) long, and divided now in three parts. Glacier de Bonne Pierre, to the northwest of the mountain. It is 3 km (1.9 mi) long. William Auguste Coolidge, a mountain climber from United States made the first direct climb up the north side of the Barre des Ecrins in July 1870. ↑ 1.0 1.1 "Barre des Écrins, France". Peakbagger.com. Retrieved 28 September 2016. ↑ 2.0 2.1 2.2 "Barre des Écrins". Summitpost. Retrieved 29 September 2016. ↑ "Ecrins, France". Peakware. Retrieved 28 September 2016. Wikimedia Commons has media related to Barre des Écrins. This page was last changed on 16 September 2017, at 03:15.